Nanjing has particular relevance to the study of qin songs:6 many such songs were created and/or published here. These songs seem particularly to have appealed to amateur qin societies and to female qin players. This and related issues are further discussed on this website under such topics as The Qin in Popular Culture: Novels and Opera anWomen and the Guqin. Xiao Luan (452-498), reigned 494-498 as Emperor Ming of Qi. Although there are qin melody titles associated with some of the persons mentioned above, the surviving versions of actual melodies of these titles cannot be reliably traced back to such a early times. Thus for actual Nanjing-related melodies one must mostly look to Ming dynasty handbooks published in Nanjing. 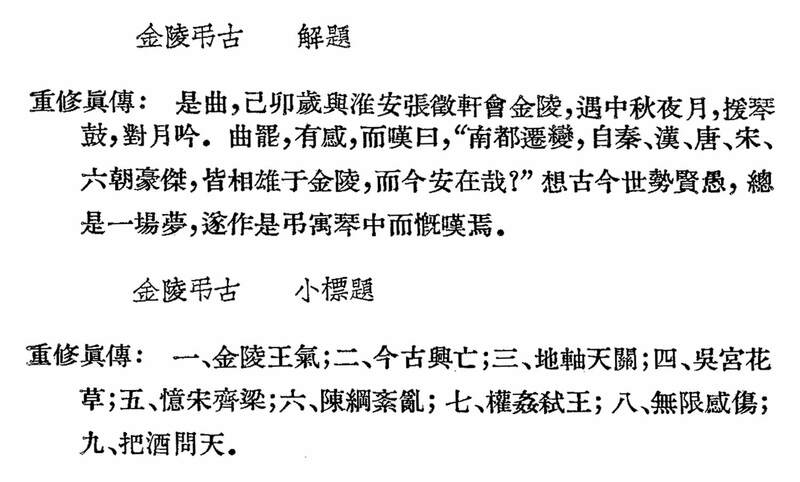 Handbook of qin master Huang Longshan, from Jiangxi but living in Nanjing (see image and QSCB, Chapter 7); the preface was written in Nanjing. Apparently printed in Nanjing by Yang Jiasen. 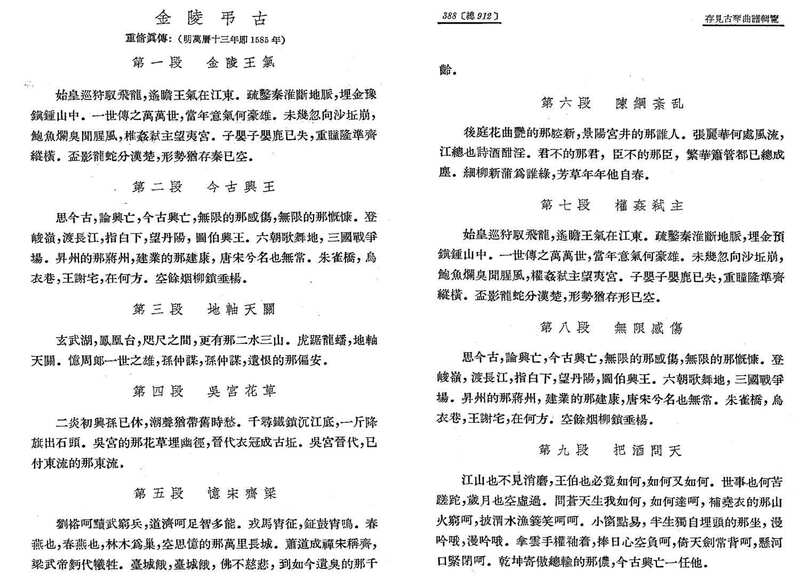 Handbook of Li Ren; tentative association with Nanjing based on its connection to Taiyin Buyi and Taiyin Chuanxi, below. Handbook of Xiao Luan; association with Nanjing, tentative and perhaps peripheral, largely based on comments by Xu Jian linked above. Second handbook of Xiao Luan; association with Nanjing also tentative. Handbook of the famous Nanjing qin master Yang Biaozheng (see image and QSCB, Chapter 7); he apparently created or adapted all of the melodies, at least two of them directly connected to Nanjing (see below). Zangchunwu is a district of Nanjing; published by eunuchs (compare Yuwu Qinpu). All three sung versions were published in Nanjing handbooks (1585, 1589 and 1618). The melody has long been associated with Ruan Ji; a famous Nanjing brick relief shows him as one of the Seven Sages. This melody, published first in Nanjing, later appears in Japanese handbooks, showing a qin connection between Nanjing and Japan dating from Shin-Etsu (Jiang Jingshou). The qin player Xiao Sihua is said to have played this here by a clear stream in Purple Mountain (details). These two melodies were apparently created by Yang Biaozheng, whose Chongxiu Zhenchuan Qinpu is included the above list of handbooks associated with Nanjing.12 However, I have not yet reconstructed them, nor to my knowledge has anyone else done so yet. Information about famous later qin players connected to Nanjing awaits further research. Jun Fang (方駿), China's Second Capital – Nanjing under the Ming, 1368-1644. Oxford/New York. Routledge, 2014 (Amazon). Tsai, Shih-shan Henry (蔡石山). The Eunuchs in the Ming Dynasty. Albany: State Universtiy of New York Press, 1996. See above for names of some qin players during these periods. A program on the theme of Nanjing could also be expanded to include surrounding areas, such as 滁州 Chuzhou, about 100 km northwest of Nanjing, location of Ouyang Xiu's Old Toper's Pavilion (see Zui Weng Yin). 3. Playing qin in Nanjing's Purple Mountain? The above image is discussed under Shishang Liu Quan. 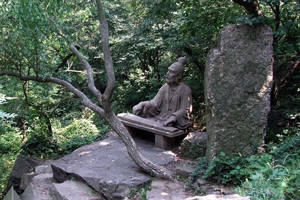 Other qin related Nanjing images include those of the Seven Sages of the Bamboo Grove (竹林七賢圖). At least three tombs in the Nanjing area have tombs with brick relief images of the Seven Sages (or Seven Worthies). The best preserved is the one discovered in 1959 in a tomb near 西善橋 Xishanqiao, a bridge on the southwest side of Nanjing. In 1968 two similar tombs, which originally also had complete sets of images, were found at 吳家村 Wujiacun (near 胡橋 Huqiao) and 金家村 Jinjiacun (near 建山 Jianshan), in northeastern 丹陽縣 Danyang county, east of Nanjing. The Seven Sages had lived near Luoyang during the time it was capital of the Wei (220 - 265) and Western Jin (265 - 317). The tombs were built near Nanjing when it was capital of the Eastern Jin (317 - 420), Liu Song (420 - 479), or Southern Qi, 479 - 502). The 晉 Jin rulers had been driven from north to south by northern tribes. To my knowledge no research has been done in this area. It is a very complex topic, and it should include analysis of how melodies published earlier and changed when published in Nanjing handbooks. I play many of these earlier versions of the melodies, but have not studied the versions published in Nanjing carefully enough to be able to discern any trends. A Jinling Qin Society (金陵琴社 Jinling Qinshe) was established in Nanjing in 1934 (Jinling is an old name for Nanjing), and today there is some discussion of an historical Jinling Qin School (金陵琴派 Jinling Qin Pai), or simply Jinling School (金陵派 Jinling Pai). Perhaps a program could be constructed of versions of melodies claiming such a connection. For example Wuzhizhai Qinpu (1722) has three melodies said to be Jinling School versions: Yi Qiao Jin Lü, Ou Lu Wang Ji, and Qiu Sai Yin (three further are listed as 金派 Jin Pai; I am not sure if this is the same). There is also Huaigu Yin from 1884. However, I am not familiar with a usable description of the characteristics of such a school, which in any case presumably changed over time. One can read of the flowering of Chinese songs and opera in Nanjing during the late Ming dynasty, but to my knowledge no detailed study has been done of Nanjing's importance to the development of qin songs. In the judgment of the Chinese this city (Nanjing) surpasses all other cities in the world in beauty and in grandeur, and in this respect there are probably very few others superior or equal to it. It is literally filled with palaces and temples and towers and bridges, and these are scarecely surpassed by similar structures in Europe. In some respects, it surpasses our European cities. The climate is mild and the soil is fertile. There is gaiety of spirit among the people, who are well mannered and nicely spoken, and the dense population is made up of all classes; of hoi-polloi, of the lettered aristocracy and the magistrates. These latter are equal in number and in dignity to those of Pekin, but due to the fact that the king does not reside here, the local Magistrates are not rated as equal with those of the Capital City...."
I do not know whether Ricci ever wrote down comments comparing Nanjing and Beijing. Much of comment here on associations with Nanjing is tentative simply because when looking in original Ming dynasty sources I sometimes cannot distinguish clearly whether references are to Beijing or Nanjing. An example is in the expression "capital city" (京師 jingshi), which apparently could refer to Nanjing even after around 1421 even after the official main capital was moved to Beijing; for the rest of the dynasty Nanjing remained a secondary capital city with parallel administrations. Apparently living in Nanjing at the time of Matteo Ricci: note the possible connection with Mozi Bei Ge. In ToC; Guide 25/212/386 lists this title only in 1585 (QQJC IV/311). The preface says that the melody commemorates Yang Biaozheng's returning to Nanjing with 張徵軒 Zhang Zhixuan (Zhengxuan?) during Mid-Autumn Festival of 1579, playing the qin and intoning beneath the moon. Translation incomplete (see jpg of full text and section titles). 疏鑿秦淮斷地脈，埋金豫鎮鍾山中.... and end ....乾坤倚傲總輸的那儂，今古興亡一任也。 Not yet translated (see jpg of full text). In Toc; Guide 26/214/396 lists a Mudan Fu only in 1585 (QQJC IV/338). The introduction recalls in spring 1575 friends going together to the 都察院 Chief Censorate to see peonies. (The Chief Censorate had moved from Nanjing to Beijing around 1425 CE, so presumably this was the location of the original Ming censorate, in Nanjing. The poem, line 12, refers to the 烏臺 Wutai, another name for the 御史臺 Yushitai, i.e, censorate.) With them was a censor, 白嶽何其賢 He Qixian from Baiyue (in Anhui). The introduction also mentions 沈萬三家 the home of Shen Wansan, a man of great wealth who built a mansion in Nanjing at the beginning of the Ming dynasty. Another possibility is Yu Xian Yin, which refers to Yang Biaozheng. None of these three has, to my knowledge, yet been reconstructed. In fact, very few melodies with extensive lyrics have been reconstructed. As of 2016 I have done several of my own reconstructions, as listed here. I do not feel that such reconstructions are complete until I can play them from memory and, in the case of qin songs, sing them, or find someone who can sing them, in a manner that seems appropriate to the lyrics.